Topps has officially announced that Daisy Ridley has signed for several Star Wars card products with her official debut in 2016 Topps Star Wars The Force Awakens Chrome. See complete details for the Rey autographs below. Collectors have long been clamoring for the popular character to sign for her breakout role and now they finally have their way. 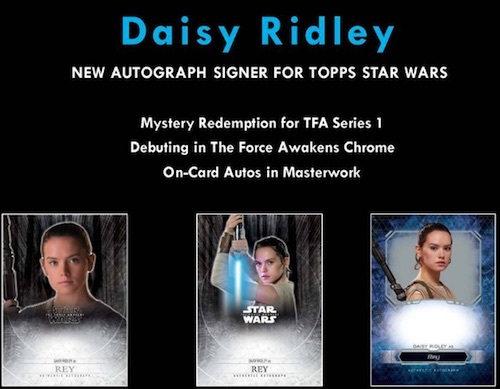 Daisy Ridley autographs first made news with Star Wars fans during the release of 2015 Topps Star Wars The Force Awakens Series 1, which originally listed her as being the Mystery Redemption Autograph. However, this was later changed to TBA, leaving many collectors wondering if and when she would sign for Topps. We can now confirm that this mystery redemption is, in fact, for Ridley. Shop for Daisy Ridley Autograph Cards on eBay. While many will treat TFA Series 1 as her first autograph given that the redemption came well before any other set, Ridley will also appear in the aforementioned Chrome TFA as a hobby exclusive, as well as the premium 2016 Topps Stars Wars Masterwork. Both the Chrome and Masterwork cards feature on-card signatures. 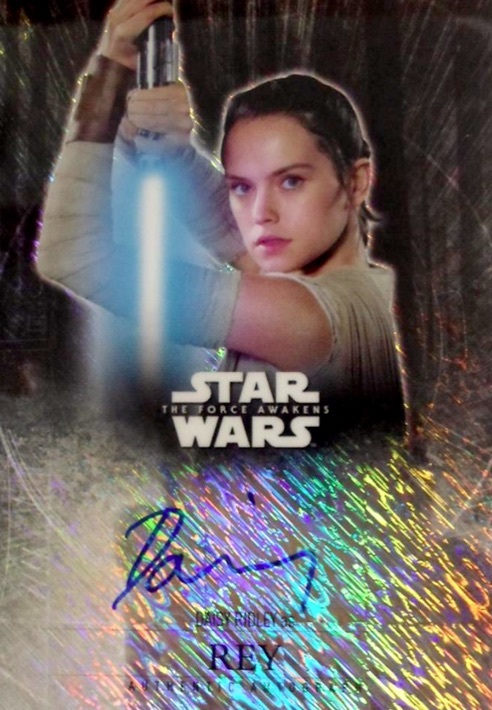 Although the Topps editions will likely be her most popular and valuable, Daisy Ridley autographs are not exclusive to Topps products. She has previously signed for several inserts in 2016 Leaf Pop Century and is part of the Fans of the Game signed insert in 2016 Donruss Football where she also has an unsigned card. It is important to note that Topps is the only place to find her official Star Wars autograph cards. 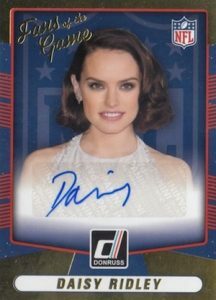 Topps kicked off the Daisy Ridley signing with several digital autographs in their Star Wars Card Trader app. 2018 Star Wars Galactic Files Rey TFA-1 SP Photo Variant! just pulled a 1/1 @2017 Topps Stars Wars Journey to the Last Jedi Adam Driver Auto! Any idea of possible value?